There is no question that the internet has changed everything. As a company with roots going back to 1966, when Bahrns Material Handling Equipment and Supplies opened their doors, we at forkliftaccessories.com know just how much the internet has changed our world of forklift accessories already. We had to do a little digging, though, to find out how it is going to change our world in the future. The latest internet acronym floating around is IoT. IoT stands for the “Internet of Things.” What’s that mean? The Internet of Things is the use of the internet by things, instead of people. Of course, people are the ones who make use of IoT technology, but the IoT is not a direct interface with human beings like a computer or smart phone is. In the largest sense of the word, the IoT includes all “smart” things. “Smart light bulbs,” for example, are light bulbs you can control with an app from your computer or smartphone. They are already widely available and will probably become commonplace before long. In the material handling world, developers are already working on IoT applications for OEM parts manufacturers. The idea is to make OEM parts smart enough to troubleshoot themselves and send out alerts when they need repair or replacement. When will a “smart hopper” become available? On a larger scale, some fleet owners are already using IoT applications on their forklift fleets. They are used to gather real-time data about how, when, why and where forklifts are being used in order to improve productivity. In one recent case, an application was able to pinpoint the cause of a series of forklift collisions in a facility. All management had to do was move the staging of goods a few yards closer to the loading dock and the problem was solved. Hoppers that include IoT apps that gauge how heavy a hopper is and send out alerts when parts hoppers need refilling. Forklift boom attachments that calculate the weight of objects lifted by the boom, their distance from the forklift’s center of gravity and the stability of the load. If the load is not safe, the app will alert the forklift operator or even shut down the forklift. Forklift replacement seats that automatically adjust to the user’s weight, height and other physical characteristics. It will be a few years yet before IoTs like these become available and come at affordable prices, but judging from the advances in internet technology we have seen, it won’t be too far into the future. When the demand is there, you will be able to find them here. 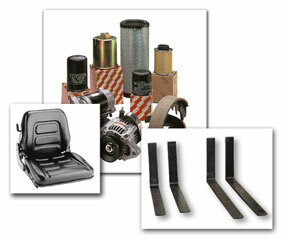 In the meantime, you can find all the forklift accessories you need today right here at forkliftaccessories.com. This Week on Forklift Accessories Blog July 2014 Week 4! Pingback: Is Your Used Forklift Redundant?